GREENWICH, Conn., July 10, 2018 /PRNewswire/ -- In the four years since Glenville Medical Concierge Care launched its membership practice, the model's appeal has grown rapidly, fueled by its highly personalized approach, according to Specialdocs Consultants. Now Glenville welcomes Ralph Cipriani, MD, an internal medicine physician with a well-earned reputation for providing exceptional care. Ralph J. Cipriani, MD, is joining Glenville Medical Concierge Care in Greenwich, CT, bringing decades of internal medicine and infectious disease expertise to the practice. "I'm thrilled to be part of a practice that has provided an unequaled level of care to the Greenwich community for more than 40 years, the last four in a concierge model. Their patients have thoroughly embraced the many benefits of concierge medicine, chief among them the time to delve into complex medical issues and focus on proactive wellness." 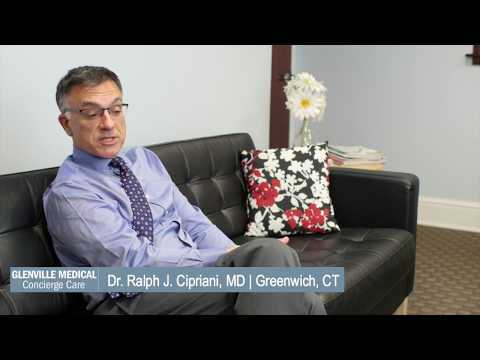 "Peace of mind knowing that questions can be answered any time is paramount to patients," says Dr. Cipriani. "At Glenville Medical, there's no longer a need to wait until Monday morning or go to the ER. Patients can just call my cell phone and receive an immediate response from the doctor who knows them best. Without a doubt, this is the most rewarding way to practice medicine." "Understanding the complex web of physical, emotional and cultural issues that affect each patient's health takes time that is simply not possible in a traditional practice. We know outcomes are significantly improved when we can identify and treat disease at its onset, and work with patients on an ongoing basis to prevent recurrence as well as promote their overall wellness," says Dr. Cipriani. "Time and availability restores the physician-patient relationship, at the core of the best possible medicine. It's the reason concierge practices continue to gain momentum in Connecticut and across the country," says Terrence Bauer, CEO, Specialdocs, a national concierge consulting company assisting Dr. Cipriani.